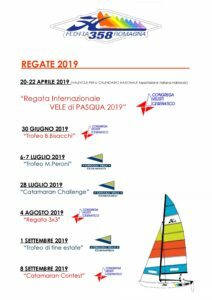 The 1st National Championship Hobie Cat Multiclass is approaching and it will take place at the Marine Village of Torvaianica (Rome), from 31 May to 2 June. The classes involved will be the Hobie Cat 16 (without gennaker), the Wild Cat and Tiger. In conjunction, it will also host the first stage of the Hobie Dragoon Cup in which kids could participate both with boats made ​​available by the organization or with their own boat. For HC 16, Wild Cat and Tiger is expected a discount on the registration fee if the enrollment happens by May 11th. A good news for all the Wild Cat and Tiger sailors is that during the Championship will be present Lamberto Cesari, national and international champion in both classes, which will take place some clinic about the setup and the speed of the two boats. Stay tuned and we will keep you updated on all the news about the organization of this exciting event.